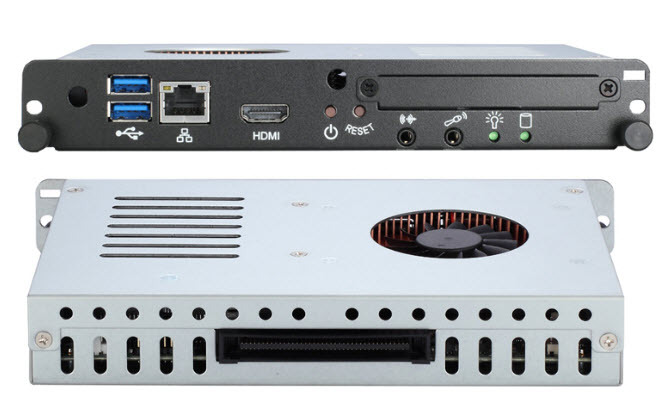 OPS870-HM Open Pluggable Specification (OPS) compliant signage player is powered by 3rd Generation Intel Core processors. The high performance OPS870-HM is based on Mobile Intel HM76 Express chipset and features 3rd Generation Intel Core processors based on the leading edge 22nm process technology. Axiomtek's OPS870-HM is engineered to be installed into any OPS-compliant digital signage platform to enable faster and easier installation, and straightforward upgrading and maintenance. It significantly provides superb graphics performance, full HD content playback, and dual display presentations. Equipped with the OPS870-HM, users can apply a variety of DOOH (Digital Out Of Home) applications with ease! 1 x LED for system power ON.